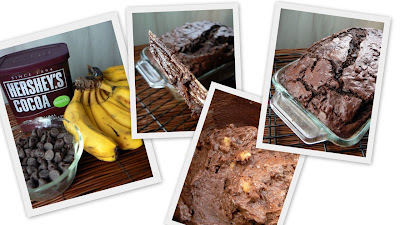 Steph of Obsessed with Baking chose Cocoa-Nana Bread this week. While at a new-to-me market the other day I found some baby bananas, just a little longer than my fingers. They looked ready to be eaten so I thought they'd be perfect for this bread. Many TWD bakers mentioned they had issues with their bread being dry. I hate over baked things. So I thought I'd bake it for 45 minutes and check it. It was so not done. I kept checking it every 10 minutes, and it was still jiggly and a knife came out so wet, I never thought it'd bake through! I'm pretty sure it wasn't the melted chocolate chips I kept seeing (see photo). Finally after 78 minutes (the full bake time), the knife came out cleaner so I just took it out. This is definatly a dense, rich chocolaty bread with a light banana flavor. Mine was almost dry (ok maybe just a tad, more than I like), and I could not finish my piece, it was so much chocolate! You really need some cold milk to go with this! PS. I just have to come back to say....try a piece of this with some whipped cream! MMM! gnam gnam greedy this cake, with all this chocolate... compliments! I wonder if adding an additional half of stick of butter would help out with the moisture factor. Or perhaps a tablespoon or two of oil. I will have to experiment when I make this.